Yet again with the hard to photograph card! 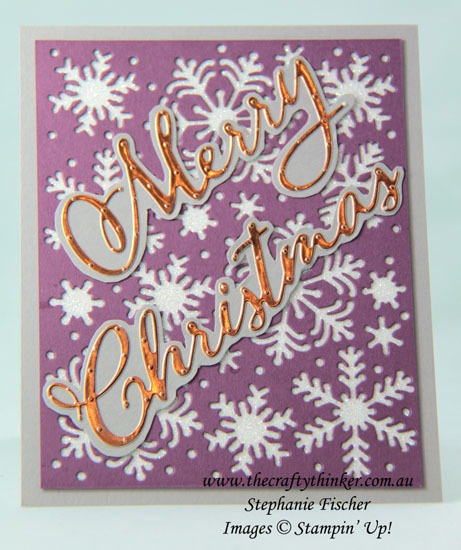 The top layer of Fresh Fig cardstock was punctuated with snowflakes using the Blizzard Thinlit die and then attached to a piece of Sparkle Glimmer paper before attaching to the Gray Granite base card. This was the clearest photo I could get but it doesn't really show the colours or sparkle properly! 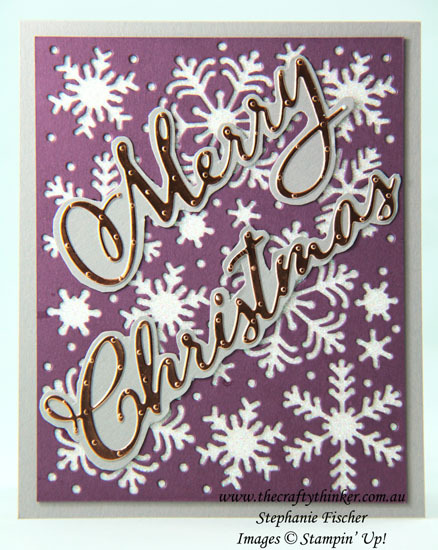 I attached the Copper Foil greeting to scraps of Gray Granite cardstock and fussy cut around it. My thanks go to fellow Crazy Crafter, Shirley Jones Taylor for that idea - although my cutting skills are far inferior to hers! Waste not, want not (as my Grandmother always used to say) - I used some of the Fresh Fig snowflakes to decorate the inside of the card.